Sweet NanSocks No need to worry about deformation or fading. No matter outside or inside,also daily wear and holiday, they have great usage. Perfect present for family members, friends and anyone you love.When you are in any place, you always attract the attention of others.The socks support personal photo,if you need the socks print your photo contact us pls. M:US 6-8,L:US 8-10,Unisex Choose.95% Polyester and 5% Spandex made. Reinforced heel and toe for enhanced durability.Eco friendly, antimicrobial, and has moisture wicking properties.Fully cushioned heel and toe for added comfort. Each pair Socks best choice for Birthday, Wedding, Anniversary, Mother's day, Father's Day Gifts, for sports, workout, dress, party use.Colorful fancy fashion design makes the socks great birthday gifts or holiday stocking stuffers! Machine or hand wash,soft and comfortable.Occasion: running,basketball,football,soccer. These Unique Fun Dress Socks are designed with numerous colors and patterns. 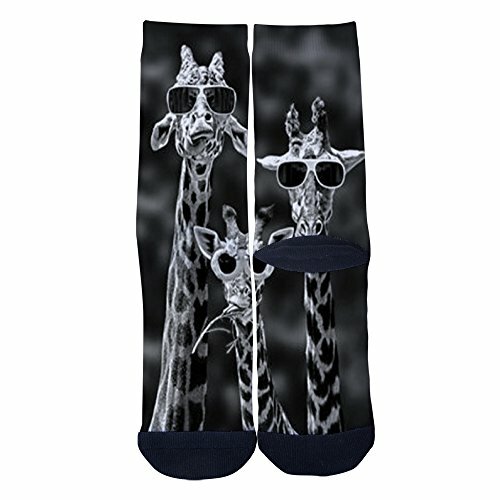 Replace your ordinary socks with our cool and fashion socks! MOISTURE WICKING TECHNOLOGY paired with an air-circulating ventilation blend means that these performance socks dry measurably faster than cotton! These elite socks work hard to keep you cool by moving perspiration away from the skin, preventing excess moisture and eliminating odors in the process. Whether you're at the field for practice, lifting at the gym, or lounging around the house, these popular Color Performance Socks are sure to make you feel just as cool as you look! If you have any questions about this product by Sweet Nan, contact us by completing and submitting the form below. If you are looking for a specif part number, please include it with your message.